Will The East London Line Ever Get Six-Car Trains? On the East London Line yesterday, I was in the front car and it was noticeable how passengers moved backwards and forwards along the train so they could find a seat and also get in and out easily at the stations with short platforms. It got me thinking, about whether six-car trains could be run on the East London Line. Before I discuss this, I’ll give a few facts. Some are history and some are future plans. I can remember taking the London Underground era line between New Cross Gate and Whitechapel stations, to get between Haywards Heath and Mile End stations. I had a client at the former and my youngest son, used to live by the latter. The trains were four-car A60/62 Stock with a length of just 65 metres! There were five intermediate stations, which coming North were as follows. The platforms and those at Whitechapel, were probably not much longer than the original trains. The platforms have been improved in recent years. 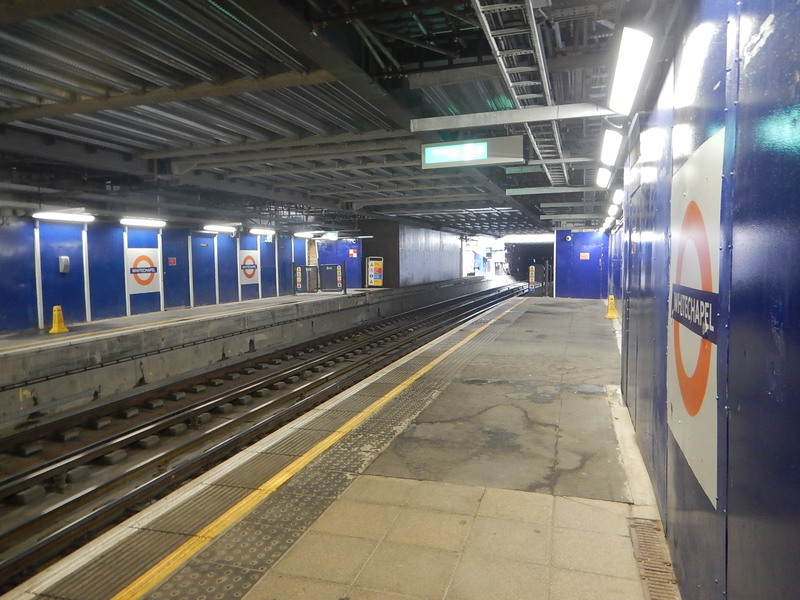 When the Jubilee Line was built, Canada Water station was rebuilt, but the platforms on the East London Line were not substantially lengthened. 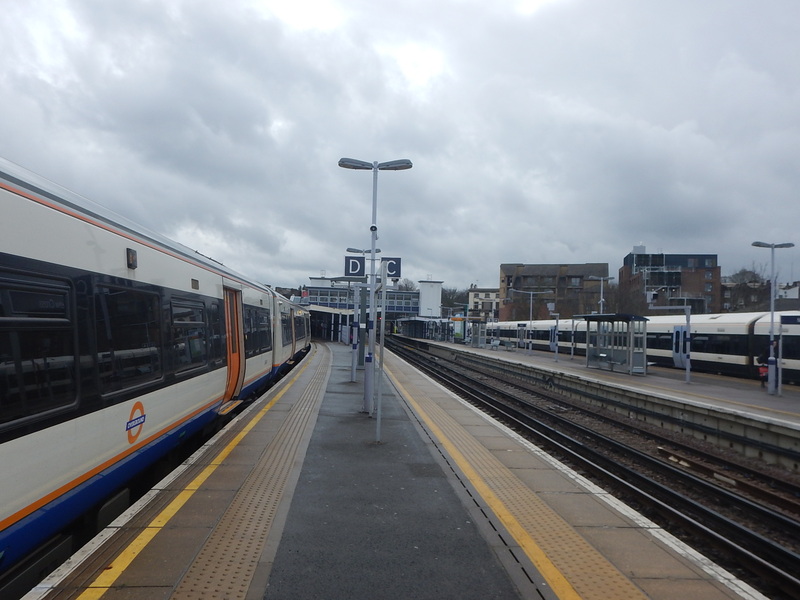 When the Overground was created in the early part of this century, the platforms ended up at their current length of around eighty metres. Recently, to create a better interchange for Crossrail, the platforms at Whitechapel station have been lengthened to around a hundred metres. So there is now four short platforms on the East London Line. The Class 378 trains were originally ordered as three-car trains, which were about sixty metres long. Was this short length to fit the short platforms or was it because it was felt that these trains would be adequate for the route? By the time, the trains entered service in 2010, the trains had all been extended to four-cars. But this was still inadequate and in 2013 an order was placed to lengthen all trains to five cars, which was completed in January 2016. Travel in the last coach of a train between Shadwell and Canada Water stations and when a station stop is made, you are left in the tunnel. Some or all the doors don’t open and a announcement tells you, that if you want to get out, you should move forward in the train. This picture shows the last carriages of a train at Canada Water station. The less-than-perfect arrangement works very well. The walk-through nature of the trains means passengers can easily walk forward if required. The announcements are numerous and clear. Only Canada Water station, with its interchange to the Jubilee Line is a busy station. But what probably makes the system work so well, is the fact that East Londoners are the World Champions at ducking and diving and they adjust their behaviour to the less-than-perfect arrangement. Travelling home to Dalston Junction station in the last carriage, I got the impression, that all platforms are built to comfortably accept five-car trains. It also appears that the two central bay platforms at Dalston Junction station were built for five-car trains. This picture shows Platform 2 at Dalston Junction station. I have looked at nearly all the Southern platforms on all four Southern branches and there seems to be few if any platforms, that couldn’t take a six-car train. It should be noted that most platforms are shared with Southern services which are run by longer trains. 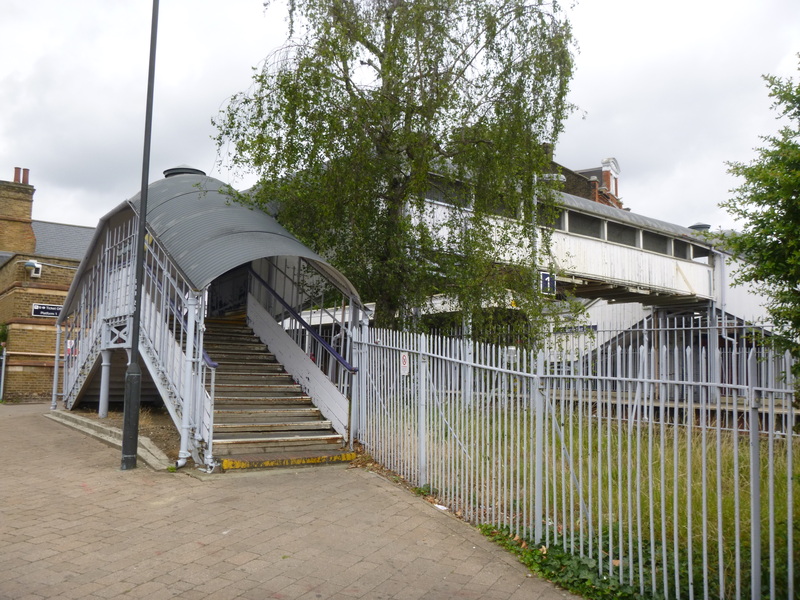 These pictures show Sydenham station. Platform lengths like these are typical of many stations. Work would be needed at Platform 2 at Clapham Junction station. But there is space to extend the platform. There are no problems at West Croydon station, where it seems all trains now use the bay Platform 1. There appear to be no plans to increase services to West Croydon station from four tph, but turning the trains in the bay platform might make scheduling easier. Whitechapel station is being rebuilt to provide an interchange between Crossrail, the District and Hammersmith & City Lines and the East London Line. The rebuilt East London Line platforms appear to be long enough for six-car trains. There will be two footbridges over the East London Line. There will be lifts and possibly escalators. It will be a major high-capacity interchange. The connection to Crossrail at Whitechapel station may actually take pressure from the Canada Water station. Will passengers from the Northern section of the East London Line change at Whitechapel for Crossrail, if they are going to the West End or Canary Wharf, rather than using the Jubilee Line from Canada Water station. As Crossrail will open up a large number of new routes, I believe, Whitechapel station will become one of the most important interchanges in East London. This table shows Transport for London’s plas for the London Overground. In 2018, two extra trains per hour (tph) are planned to be run between Dalston Junction and Crystal Palace. In 2019, two extra tph are planned to be run between Dalston Junction and Clapham Junction. This will mean that the frequency through the core of the East London Line will rise from 16 tph to 20 tph. This will be a train every three minutes. It also means that the London Overground will be running ten tph between Whitechapel and Sydenham stations, with a call at New Cross Gate, which could become an important interchange. I think that, unless someone can come up with an innovative solution, that there will need to be some platform l;lengthening to accommodate six car trains on the East Londoin Line. The tricky problem would be extending the platforms at Shadwell, Wapping, Rotherhithe and Canada Water stations. After the increase of frequencies to Crystal Palace and Clapham Junction to four tph, there will be twenty tph, through the core of the East London Line. With five-car trains, this would be a hundred cars per hour and with six-car trains, it would be 120 cars per hour. Suppose another four tph, were to be squeezed through the core, then this would be 24 tph. With five-car trains, this would be 120 cars per hour. There would be two main alternatives to increase the frequency. Run six tph on all the four routes. Add a new route, with a frequency of four tph. Twenty-four tph, is a frequency that is proposed for Crossrail and Thameslink using digital signalling. There will be one train every two and a half minutes. No major engineering work would be required at the stations with short platforms. I very much feel, that increasing the frequency of trains, will be more affordable than using six-car trains. Note these points about running trains through the core of the East London Line. 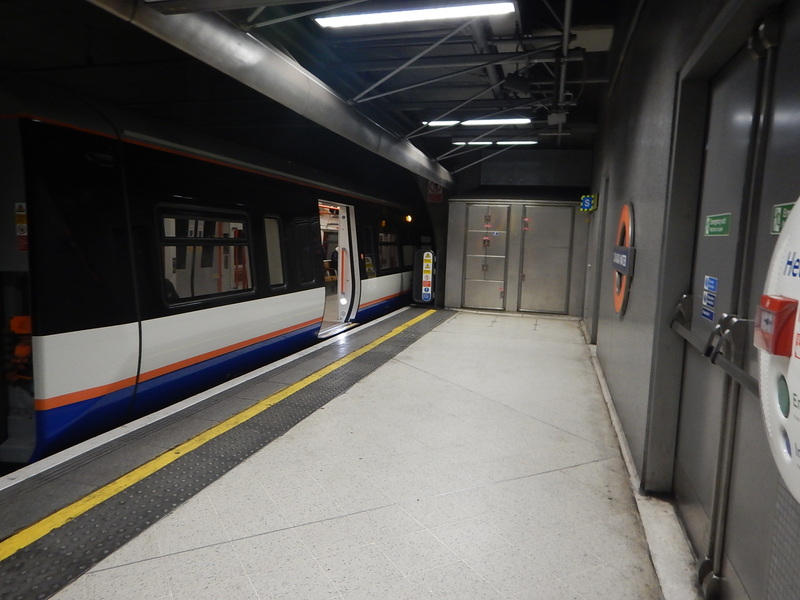 Class 378 trains have an end door, so that passengers can be evacuated in the Thames Tunnel. Aventras don’t have end doors and would need to be updated. Five-car Class 378 trains can be replaced by Aventras on the North London Line and the Watford DC Line, to release more trains for the East London Line. But the biggest problem, is probably that Bombardier don’t make Electrostars any more, and the factory ihas been turned over to Aventra production. I will be very surprised if Network Rail’s original plan on six-car trains on the East London Line happens in the next few years. The August 2018 Edition of Modern Railways has a two-page article on the latest on the new Class 710 trains for the London Overground. Wikipedia says this about the seating.under Background And Specifications. The units will be delivered in two sub-classes; an AC-only version with longitudinal and transverse seating (very similar to the S8 units on the Metropolitan line of the London Underground) for use on the West Anglia and Romford-Upminster services, and a dual-voltage version with longitudinal seating for the Watford DC and GOBLIN services. But it now appears that all the seats on the trains will be longitudinal ones. 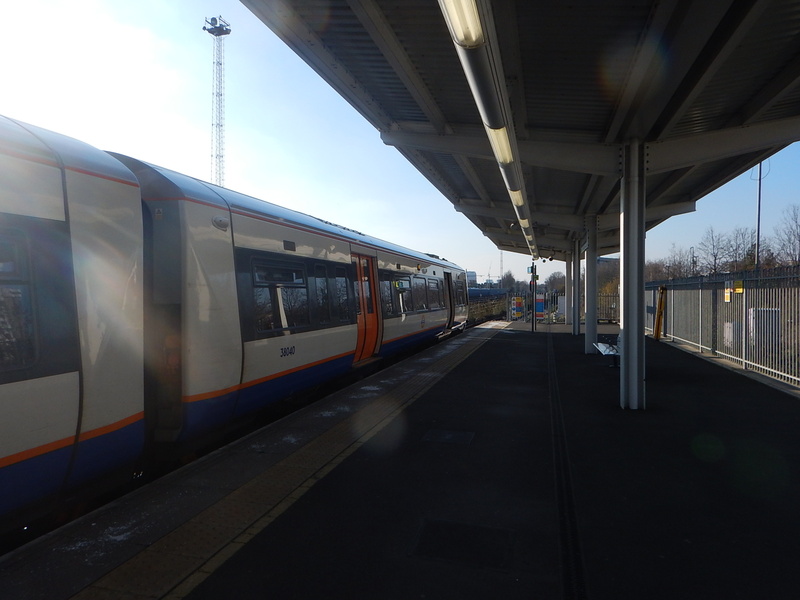 I use the current trains a lot to go to Walthamstow and I also use the Class 378 trains, which have longitudinal seats, frequently on the North and East London Lines of the Overground. I probably aren’t bothered too much about longitudinal seats, but I suspect there will be others who will complain. This discussion of RailForums is entitled Annoying Things About The Class 378. Search for “seat” and you don’t find many complaints about the longitudinal seating, which is also used on much of the Underground. On the other hand, if all the trains have identical interiors, this must save on construction and maintenance costs. If the interiors are basically similar to the Class 378 trains, it must also save on staff training costs. I actually think, that the biggest complaint will not be about the new trains, but why don’t the older Class 378 trains have wi-fi and USB charging points! The article also states that services on West Anglia routes to Cheshunt, Chingford and Enfield Town stations will work as eight-car trains or a pair of four-car trains. If they are always working in pairs, why not build them as eight-car trains in the first place? In A Detailed Layout Drawing For A Class 345 Train, I said that the formation of a Class 345 train for Crossrail is as follows. Note.that the train is composed of two identical half-trains, which are separated by the TS(W) car. As the Modern Railways article says that these trains are to be the last to be delivered, would it not be sensible to fully understand the four-car units and then decide if instead of pairs of four-car units, they were built as eight-cars. Trains would be formed of identical four-car half-trains. An eight-car Class 710 train would be nearly fifty metres shorter than a nine-car Class 345 train. Passengers would be able to walk through the whole train. Passengers can position themselves for their best exit at their destination station. Would passenger security be better on a train, where passengers could walk all the way through? Aventras and other modern trains are fitted with intelligent control systems, that determine the number and type of the intermediate cars in the train. Two Driving Motor Standard Cars (DMS) would be replaced with simpler Trailer Standard (TS) or Motor Standard (MS) cars. The choice of a TS or MS car would depend partly on performance issues, which could be tested with the earlier four-car trains. Building and maintenance cost savings by reducing the number of driving cars, must be possible. Capacity could be increased by adding cars in the middle, if platforms were long enough! Would providing overnight stabling for fifteen eight-car trains be easier than for thirty four-car trains? It should also be noted, Cheshunt station has a very long platform without a roof. Passengers could walk to the front of the train inside a warm dry train. This already happens with the Class 378 trains at Highbury & Islington station. The Modern Railways article says this about the service on the Romford-Upminster Line. TfL is still considering whether to utilise a ‘710’ on the Romford to Upminster shuttle or to retain an older unit for the line. I wrote about this in A Heritage Class 315 Train For The Romford-Upminster Line, after this article in London Reconnections, which is entitled More Trains for London Overground: A Bargain Never to be Repeated, said that it is possible that this line could be served by a Class 315 train, held back from the scrapyard. If it is decided that a Class 315 train is to be used on the Romford to Upminster Line, I believe that the service could be marketed as a quirky heritage unit, that in conjunction with its main purpose of providing a public service, could also be used for other education, training, marketing, innovation and research purposes. Eversholt Rail Group might even shift a few redundant Class 315 trains! The Modern Railways article says this. A £7million investment has seen the stabling facility at Chingford upgraded, including the addition of an AVIS-scanner here as well. These pictures show the investment. With the Automatic Vehicle Inspection System (AVIS), Chingford is becoming more than a stabling facility. Note the large maintenance structure, so that trains can be worked on in the dry. I have a few of my own questions. If The Thirty Four-Car Trains For West Anglia Routes Are Converted To Eight-Cars, What Happens To The Spare Driving Motor Cars? If the thirty four-car trains are converted to fifteen eight-car trains, it appears to me that Bombardier could have at best many of the long-lead components for thirty Driving Motor Standard (DMS) cars. At worst, they would have thirty DMS cars for Class 710 trains. But London Overground will have need for a few more trains in a few years. In Increased Frequencies On The East London Line, I showed this London Overground table of improvements. Note that two extra tph are proposed on the Liverpool Street to Enfield Town service. I calculate, that this would need another two Class 710 Trains. Similarly, to add two tph to the Liverpool Street to Cheshunt service, would appear to need another three trains. The Mayor is also looking favourably at creating the West London Orbital Railway. I estimate that the two proposed routes would need around four trains each to provide a four tph service, if they could be run using dual-voltage Class 710 trains with a range of perhaps ten miles on battery power. What Is Happening About The Hall Farm Curve? I heard from someone, who should know, that the Hall Farm Curve and the Coppermill Curve will be reinstated. These curves would allow the following. A direct service between Chingford/Walthamstow and Stratford. Better access to the upgraded stabling at Chingford. But I think these curves would be invaluable in maintaining services, during the construction of Crossrail 2. Will A Bay Platform Be Developed At Lea Bridge Station? I also wonder if a bay platform will be developed at Lea Bridge station, which would enable a four tph service to be run between Lea Bridge and Chingford stations, if Chingford Branch trains couldn’t get into Liverpool Street station, because of construction works. I certainly feel that the curves connecting the lines at Coppermill Junction will have a major part to play in the development of East London’s railways. The East London Line was opened in May 2010 using pieces of redundant infrastructure in the East of London. The East London Branch of the Metropolitan Line. The Thames Tunnel, built by the Brunels. The viaduct of the North London Line to its historic terminal at Broad Street station. A massive bow-spring bridge over Shoreditch High Street. A tunnel under Dalston High Street. A flyover North of New Cross Gate station. New stations at Dalston Junction, Haggerston, Hoxton and Shoreditch High Street. A new fleet of Class 378 trains were purchased and services began between two Northern and four Southern destinations, at a frequency of four trains per hour (tph). Looking back just over eight years later, the line has been an overwhelming success. The proof of this success surely is shown in the increasing capacity of the line since 2010. The Class 378 trains have got longer. In 2010, they started at just three cars. They were soon extended to four cars. In 2016, all trains became five cars. The trains could go to six cars, but there are platform length issues, that make five cars the current limit. On the other hand, selective door opening could be used, which works so well with walk-through trains. Now, Transport for London are going to increase frequencies on the line. In 2018, an additional two tph will run between Dalston Junction and Crystal Palace stations. In 2019, an additional two tph will run between Dalston Junction and Clapham Junction stations. This would give twenty tph between Dalston Junction and Surrey Quays stations. Given that Crossrail and Thameslink will handle twenty-four tph in their central tunnels, I suspect that to have the same frequency on the East London Line would not be impossible. These developments will happen, that will affect the East London Line. The Whitechapel station interchange with Crossrail will become the Jewel in the East, as it will give access to Canary Wharf, the West End, Stratford, Liverpool Street, Paddington and Heathrow to all those (like me! ), who live along the East London Line. As both lines will have train frequencies of at least twenty tph, you should never wait more than a few minutes for your train. I can see, the number of passengers changing between Crossrail and the East London Line being very high. For many travellers it will be their quickest way to Crossrail. The Class 378 trains are more passenger-friendly than Thameslink’s Class 700 trains, which are best avoided, by those with sensitive posteriors. Whitechapel station gives access to both the Eastern branches of Crossrail. All East London Line services call at Whitechapel. My scheduling experience says that the frequency of trains on Crossrail and the East London Line should be the same, to smooth travellers passage through the station. So expect Crossrail to eventually push the East London Line to twenty-four tph. The Sub-Surface Lines of the London Underground are being re-signalled, which will mean more capacity, where the District and Metropolitan Lines interchange with the East London Line at Whitechapel station. There could also be improvements on the Jubilee Line, where it meets the East London Line at Canada Water station. I doubt we’ll see more improvement to the Victoria Line, as you can only extract blood from a stone for a limited period. It is also probably true, that Dear Old Vicky needs some relief. The new South Eastern Franchise will be awarded in August 2018, with the new incumbent taking over in December 2018. The current Southeastern services have little interaction with East London Line services, except at New Cross station, where the following services call. Southeastern – Northbound – Eight tph to Cannon Street via London Bridge. Southeastern – Southbound – Eight tph to Lewisham via St. John’s. Overground – Four tph to and from Dalston Junction. New Cross is a good interchange for travelling to and from South East London and I suspect the new franchise will only make it more useful. The Northern City Line has been ignored for decades and in my view it is a disgrace with elderly Class 313 trains, dirty, dark and dingy stations and unmotivated staff, who seem abandoned by their employers. If ever there is a line that should join the Overground, it is this one! At least, the line is getting new Class 717 trains, which will bring the following. Modern trains with wi-fi and hopefully comfortable seats. Up to twelve tph between Moorgate and Alexandra Palace stations via Highbury & Islington and Finsbury Park stations. More passengers to the East London Line at Highbury & Islington station. A direct cross-platform and step-free link for the Victoria Line to Crossrail. Planners do not seem to have realised the effects these new trains will cause in North London and at Highbury & Islington station in particular. In the next few years, there will be improvements on the North London Line. Increased frequencies to Clapham Junction station have already happened. West Hampstead station is being rebuilt. New Class 710 trains will reinforce the current Class 378 trains. Old Oak Common Lane station will connect to Crossrail and High Speed 2, when that line opens in 2026. All these improvements will bring more passengers to the East London Line and put more pressure on Highbury & Islington station. Only two stations on the East London Line; Dalston Junction and Shoreditch High Street, were designed to have development on top. Dalston Junction station has now been virtually fully developed and only now are tower blocks starting to grow around and on top of Shoreditch High Street station. The City of London will also expand to the East, which will mean more offices and housing clustered around stations like Whitechapel, Shadwell and Canada Water. Property developent will greatly increase the ridership of the East London Line. 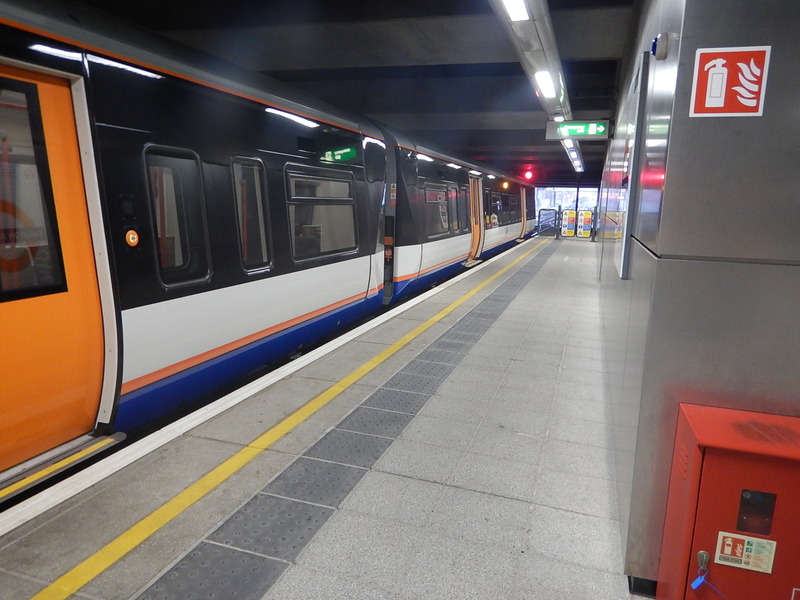 Many travellers in East London, use the Overground to get to Highbury & Islington station for access to the Underground. The below ground section of this station needs substantial improvement with a second entrance, more escalators and lifts. Plans get talked about, but nothing happens. I believe that the new Class 717 trains on the Northern City Line could be the straw that breaks the camel’s back, as they will bring more travellers to the station. But on the other hand the existing cross-platform interchange with the Victoria Line, might mean that less travellers need to go to and from the surface. I have this feeling, that a rebuilt Highbury & Islington station will happen before 2030 and would attract more travellers to the East London Line. These developments could happen, that will affect the East London Line. 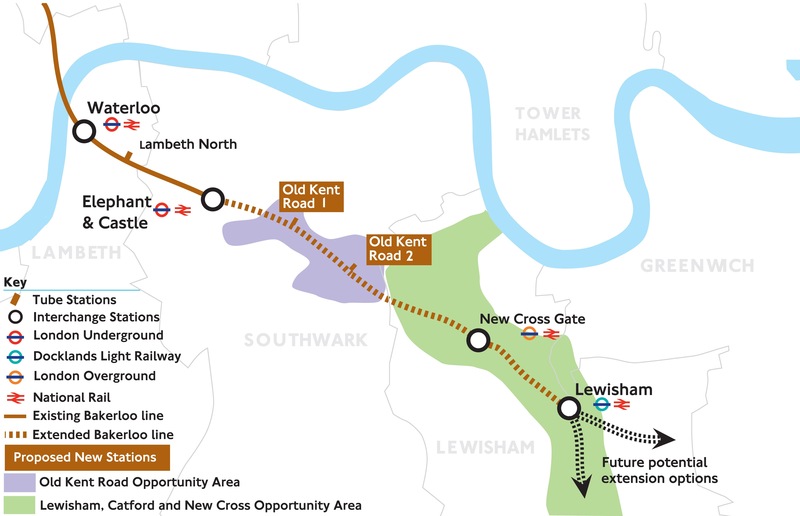 I believe extending the Bakerloo Line to Lewisham station is more likely to happen than Crossrail 2 and if it was built it would connect to the East London Line at New Cross Gate station. This map shows the extension. I believe that the East London Line and the extended Bakerloo Line will complement each other. The Bakerloo Line will probably have at least twenty tph between Queen’s Park and Lewisham stations via Waterloo, Oxford Circus and Baker Street stations. The East London Line will have at least six tph between Highbury & Islington and Crystal Palace stations and four tph between Highbury & Islington and West Croydon stations. New Cross Gate is currently a step-free station, so I suspect it will be a very smooth interchange. Connections between South East and the whole of North London will be substantially improved. It has been suggested that Brockley station be connected to the line between Nunhead and Lewisham stations, which crosses over the station. Wikipedia says this about the connection. At the London end the line is crossed by the Nunhead to Lewisham line. At this location adjacent to Brockley station was sited Brockley Lane station which closed in 1917 with the original London, Chatham and Dover Railway branch to Greenwich Park. The connection of that line to Lewisham is a later development. The possibility of opening platforms on this line with direct access to Victoria Station and the Bexleyheath Line to Dartford has often been suggested but is currently low on TfL’s priorities. In some ways the Bakerloo Line extension to Lewisham does a similar job in connecting the East London Line to Lewisham, but at a much higher frequency. Another problem with the Brockley Interchange is that there are only two tph between Victoria and Lewisham, that pass over Brockley station and does the capacity at Lewisham station exist to allow this to be increased to a viable frequency, that would make building Brockley Interchange an interchange worth building? Will Crossrail 2 be built or even started before 2030? I personally doubt it, unless Brexit is an unqualified success and the project is privately-funded. There are also other projects that might lower the need for Crossrail 2 and allow it to be delayed to beyond 2030. I can remember reports, when the London Overground was created, that suggested that some East London Line services, might be extended to the West, possibly to Willesden Junction station. I think there are two major problems. 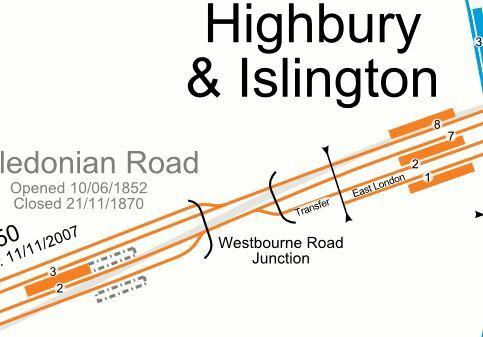 Trains going West from Highbury & Islington station from the East London Line could stop in Platform 1 or 2 and go straight through on their way to Clendonian Road & Barnsbury station. But those going the other way would probably need to cross tracks on flat junctions! Where is the suitable bay platform to turn the trains? On the other hand, many passengers would find it useful, as it would avoid a change at Highbury & Islington station. This map from carto.metro.free.fr shows the lines through Penge West and Penge East stations. The two stations are a valid out-of-station interchange, but neither is step-free. Penge East station could be difficult to make step-free, as the footbridge is listed. I think that it is one of those structures that Network Rail wouldn’t miss, if it was decided to install it at the National Railway Museum. Could this be one of the reasons, why it has been suggested that a new station be built, where the lines through the two Penge stations cross. It could be fully step-free. The station would be built on railway land. It would have four tph between Victoria and Bromley South stations. It would have four tph between Highbury & Islington and West Croydon stations. It might also be possible to have platforms on the Crystal Palace branch, thus adding six tph between Highbury & Islington and Crystal Palace. stations. The station could have Thameslink platforms. 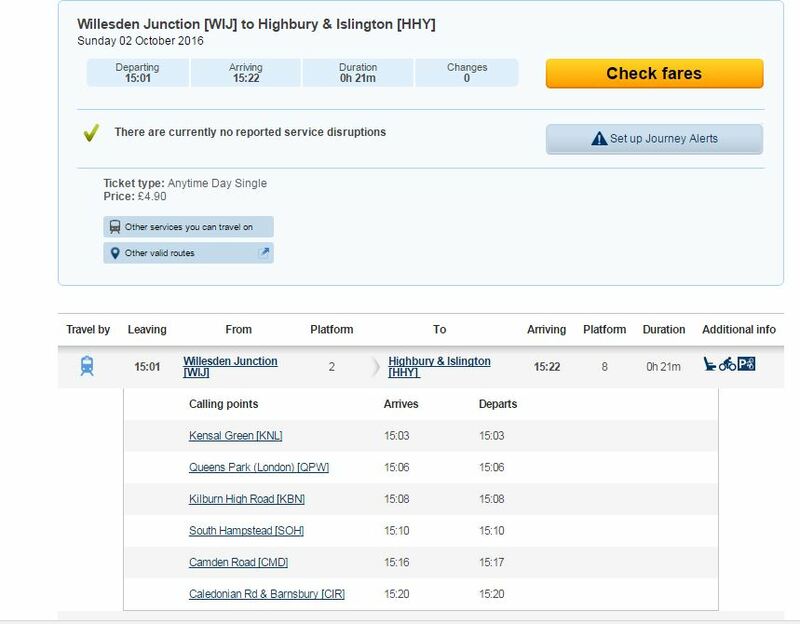 Note that the Penge Interchange offers four tph to and from Victoria, whereas the Brockley Interchange only offers a measly two tph. Penge Interchange might allow the two older Penge stations to be closed. The Central Line passes directly underneath Shoreditch High Street station, as this map from carto.metro.free.fr shows. 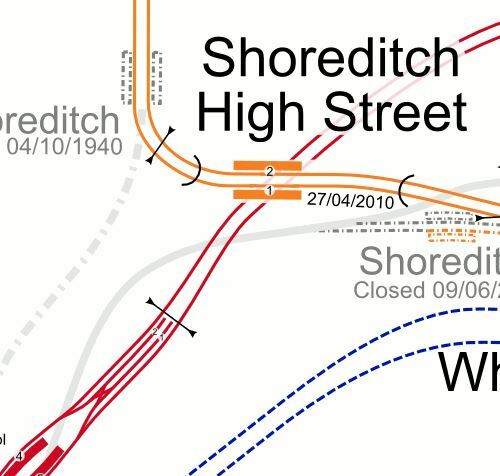 Note the reversing sidings at Liverpool Street station in the South-West corner of the map. Wikipedia says this about the possibility of creating an interchange. There have also been discussions of creating an interchange with the Central line between Liverpool Street and Bethnal Green which runs almost underneath the station. However, this would not be able to happen until after the Crossrail 1 project is complete, due to extreme crowding on the Central line during peak hours. Liverpool Street to Bethnal Green is one of the longest stretches on the Underground without a station. There is a lot of residential and housing developments, being proposed for around Shoreditch High Street station. Large numbers of passengers use the East London Line to get to Highbury & Islington station for the Underground. Would a Shoreditch High Street connection take the pressure off? It could give East London Line travellers, a single-change connection to Liverpool Street, Bank, St. Paul’s, Chancery Lane and Holborn stations. For construction and operational reasons, the decision to create this connection will not be taken until Crossrail is fully open. I suspect passenger statistics will play a large part in the decision. Southeastern has three main terminals in London. Victoria – Circle, District and Victoria Lines. But they also serve other stations in South London with good connections. The rebuilding of London Bridge station has probably improved connectivity, but are further improvements needed? Two of the possible improvements to the East London Line; the Brockley and Penge Interchanges will connect current Southeastern services to and from Victoria to the East London Line. Would the new South Eastern franchise like a connection to the East London Line? ,Passengers to and from East London surely have have an easier route, than going to Victoria and then using the Underground! Both new interchanges would give a route to Crossrail at Whitechapel, which is not an easy connection to and from Victoria. I have looked at timings and it appears that the Whitechapel route is perhaps five minutes slower to the West End or Paddington, but perhaps a dozen minutes faster to the Northern part of the City of London. It is my view, that if Penge Interchange is built, then Brockley Interchange could be forgotten. With all the money spent on Thameslink, it is likely that Network will want to maximise their investment by running as many trains as possible on the route. Currently, the plan is for twenty-four trains an hour through the central tunnel, which then split as follows. Sixteen tph via London Bridge of which twelve tph continue to East Croydon. It would also appear that there are another five tph between London Bridge and East Croydon, but only one tph runs on the fast lines. So there would appear to be plenty of capacity between London Bridge and East Croydon stations, even if the central tunnel frequency on Thameslink were to be upgraded to thirty tph. I think we might see a bit of sorting out of Thameslink to minimise some of the problems, that became evident after the May 2018 timetable change. A problem I have, which I share with the millions in East London, is that it is difficult to get to Gatwick Airport, as there is no common station between the East London Line and Thameslink. 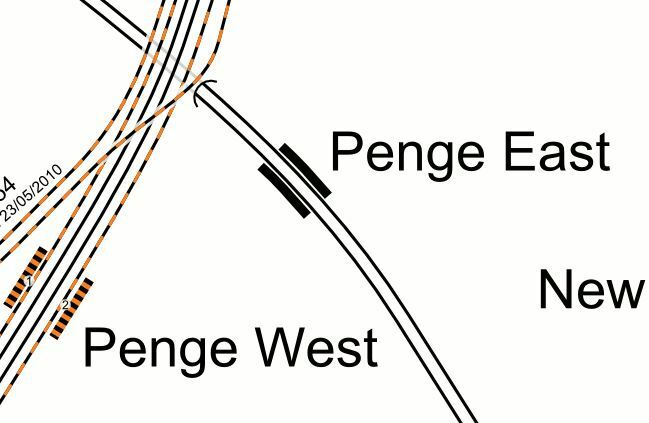 If the Penge Interchange is built, should Thameslink trains stop at the station? When the Bakerloo Line is extended to New Cross Gate station, should Thameslink trains stop at the station? 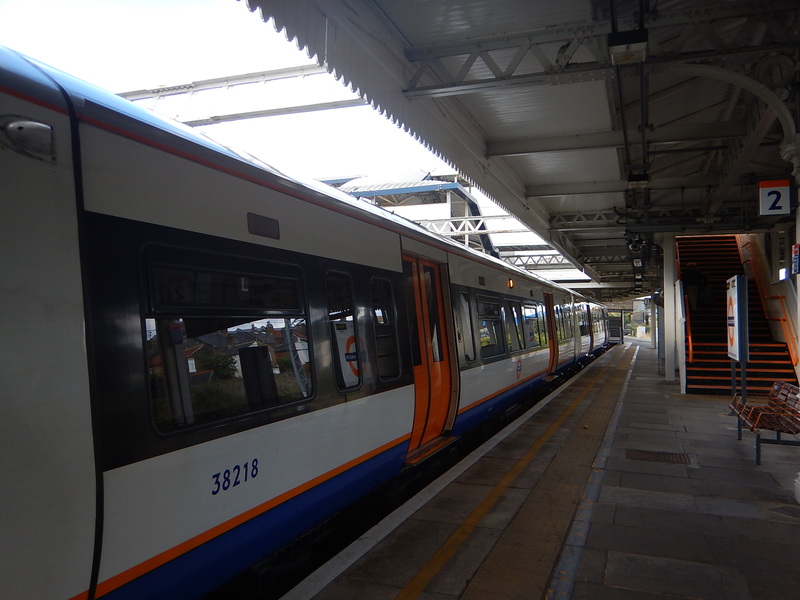 Should all slow trains on the line be run by the London Overground? Should all fast trains on the line be run by Thameslink? Thameslink could be so much more useful. From a personal point of view, when I go to Croydon, I want to get to East Croydon station, as I’m usually taking a train to the South Coast or Gatwick Airport. Inevitably, I end up taking a tram from West Croydon to East Croydon station. Ging the other way is more difficult, as I inevitably get lost trying to find West Croydon station. Although, there are now some trams at East Croydon only going to West Croydon. Trains to the North of Penge West station, never seem to be very full. East Croydon station is more important than West Croydon station. So would it be better if the East London Line trains went to East Croydon? The problem is that there is no space in East Croydon station. Perhaps two new platforms could handle both East London and West London Line services. 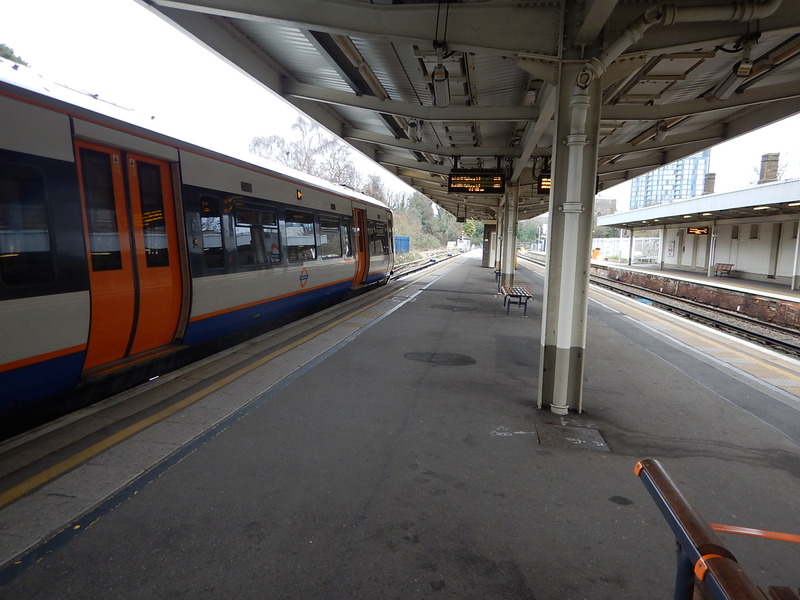 West London Line services should also be run by the London Overground, as was proposed by Chris Gibb, as I wrote about in Gibb Report – East Croydon – Milton Keynes Route Should Be Transferred To London Overground. Sort out Victoria and Thameslink services at East Croydon station, so that all Northbound and Southbound services used a separate pair of platforms, with one platform face for Thameslink and the other for Victoria services. If possible, move services like London Bridge to Uckfield to Thameslink. Put a pair of terminal platforms under the Thameslink and Victoria services platforms, connected to these platforms by escalators and lifts. Most of the tunneling would be under railway property North of East Croydon station. These platforms could probably handle up to six trains per hour (tph) each. It would be possible to run six tph between Highbury and Islington and East Croydon stations. The West London Line could have a highly desirable four tph to the mega-station at Old Oak Common. It might even be possible to use the platforms for service recovery on Thameslink. It could release the pressure on the difficult Windmill Bridge Junction, which is a bit of a bottleneck. It would be costly, but planned properly, I believe it could be created without any major disruption to the existing East Croydon station. It would create a simple one-change link between Gatwick Airport, Brighton and other South Coast destinations to the following. Through services to London Bridge, St. Pancras and Victoria. East London Line services to East London and Whitechapel for Crossrail for the City, Central London and Shenfield. West London Line services to West London and Old Oak Common for High Speed 2, West Coast Main Line and Crossrail for Heathrow and Reading. Capacity at East Croydon would probably be increased. The East London Line will get better and better. Lewisham council has issued a call for the Overground to be extended to Lewisham town centre as part of a wider series of improvements to the local rail and DLR networks. 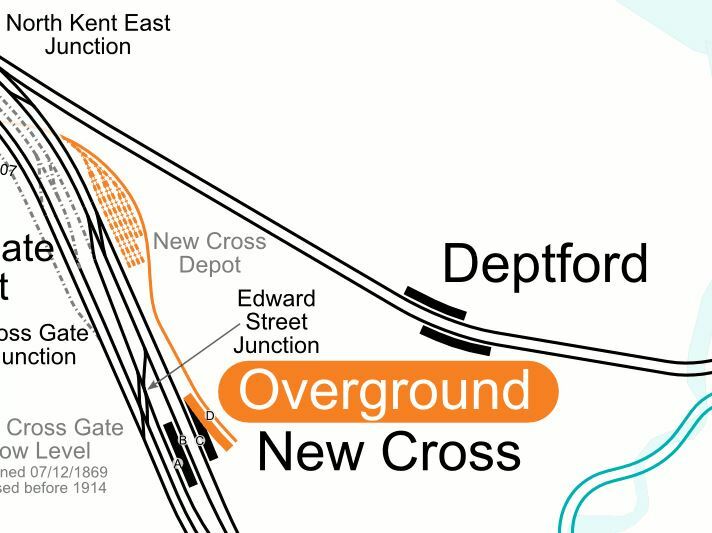 To extend the Overground from New Cross station, Overground trains would need to be able to cross over to the tracks through the station. This map from carto.metro.free.fr shows the tracks at the station. 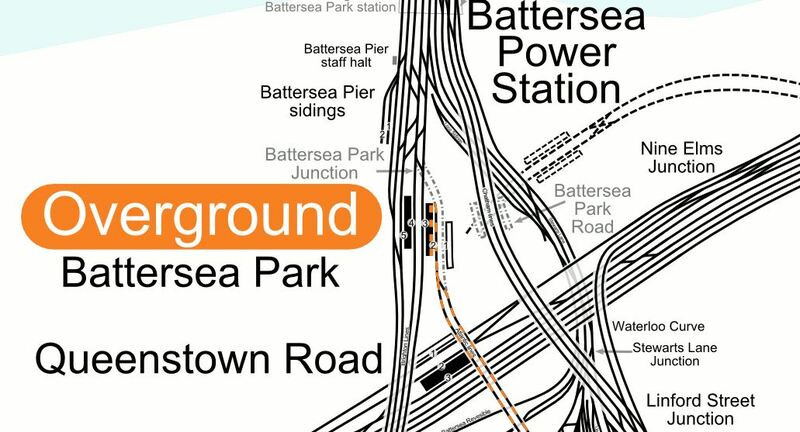 There are four Overground trains from Dalston Junction station and they terminate in the bay Platform D.
Note how the Overground skirts round New Cross Depot to get to the platform. This Google Map shows the curve of the Overground Line and what lies between the lines out of London Bridge station and the Overground. It looks to be the old New Cross depot and a green space surrounded by rail tracks, that is all inaccessible to the public. I took these pictures as I passed. The Lines out of London Bridge are much higher. It’s quite a big space. It might be possible to connect the Overground to the down slow line, that goes through Placform C at New Cross station. It would need a tunnel under the lines out of London Bridge to connect to the up slow line, which is goes through Platform A at New Cross station. I suspect this connection would be difficult and the lines would have to be slewed to the West, so that trains could dive under the down slow line. Do Network Rail want to cause all the grief at London Bridge, whilst they built the junction. It could be a challenging and very expensive project. It might even be impossible! On the other hand, it might be possible using flat junctions, but this line is busy and building and operating them could be the stff of nightmares. Merging ten trains to and from Cannon Street with four trains to and from Dalston Junction could be extremely difficult. It should be said that the interchange between Overground services arriving at New Cross and Southbound services on Southeastern is just a walk across between Platform D and C, which is shown in the picture below. Note the Overground train in Platform D.
It appears that most Overground trains from Dalston Junction, connect to a Lewisham train after between five and ten minutes. As there is a coffee stall on the station, on a cold day, you can buy a hot drink. The problem is coming North, as you have to use the step-free foot bridge from Platform A. Too many times, I’ve negotiated the bridge only to arrive on Platform D, to watch the Overground train disappearing. Currently, the frequency of trains on the East London Line is as follows. In the next couple of years, Crystal Palace and Clapham Junction services will be raised to six tph. I wrote about this in Increased Frequencies On The East London Line. This will mean that New Cross Gate will have ten tph on the East London Line, as against four at New Cross. I don’t know whether it’s possible to increase the Dalston Junction to New Cross service to six tph, but this would reduce the wait, when changing at New Cross to go North. The Bakerloo Line is being extended to New Cross Gate and Lewisham, so perhaps in the future, East London Line passengers will go via New Cross Gate. I have read, that Transport for London would like to make it easier to change between New Cross and New Cross Gate stations. Last night, I was made aware of the Camden High Line proposal. On their web site, they say this is their mission. Our mission is to transform the disused railway into a sustainable green space and transport link that is open for and used by everyone. This map from carto.metro.free.fr shows the disused railway tracks. The line shown in orange is the North London Line of the London Overground. Camden Road is a two-platform station, with full step-free access. Maiden Lane is a disused station, that closed a hundred years ago. I would assume that the two dotted lines between the two stations, will be converted into the Camden High Line. This Google Map shows the North London Line between Camden Road and Maiden Lane stations. One of the most striking features visible from this map, is the large amount of development going on to the South of the North London Line. The new residents and workers could probably do with a good walking and cycling route between Camden Town and Kings Cross. The North London Line is a heavily-used passenger and freight route and it is unlikely, that traffic levels will drop. There are now two electrified rail routes across North London; the North London Line and the Gospel Oak to Barking Line. As two of the UK’s main container ports; Felixstowe and London Gateway, are not served by electrified railways, this still means that large numbers of diesel-hauled freight trains have to pass through North London to get to the Midlands, North and Scotland, despite the routes from Ipswich and Tilbury being fully-electrified. These diesel-freight trains are boosted because the alternative route via Ipswich, Ely and Peterborough is not electrified. The following needs to be done to seriously cut the number of diesel-hauled freight trains through North London. Replace a large fleet of polluting diesel Class 66 locomotives with modern electric units. In some ways, the replacement of the locomotives by private freight companies is the largest stumbling block. However, I think that the two shorter lengths of electrification will happen, which will mean that less diesel-hauled freight trains will pass through London, as they will go via Peterborough. On the other hand, the need for freight trains will increase. More traffic to and from the ports. Freight to and from the Channel Tunnel, which must go through London. Trains carrying vehicles seem to be becoming more numerous. I wouldn’t be surprised to see calls from the rail freight industry for improvements to the two freight routes through London. One thing that will help freight trains, would be extra passing loops, where freight trains can wait for the passenger trains to overtake. The double track of the Camden High Line is one of the few places, where another freight loop could possibly be installed. Sometime this year, two extra passenger trains per hour (tph) will run on the North London Line between Stratford and Clapham Junction stations. This will bring the frequency to six tph. On the past history of the London Underground, this will mean more full trains and pressure for longer trains and more services. But the biggest changes will come in the next few years with a new Old Oak Common station, which will connect the North London Line to HS2, Crossrail, Chiltern, Great Western Railway and the West Coast Main Line. Remember too, that the North London Line will be connected to Crossrail at Stratford. Will these developments create a demand for extra trains on the North London Line? Camden Town station on the Northern Line is being extended, with a new Northern entrance closer to the North London Line. Will better routes be provided between Camden Road and Camden Town stations? Camden Town station’s new entrance will be to the North of the current entrance just off Kentish Town Road. 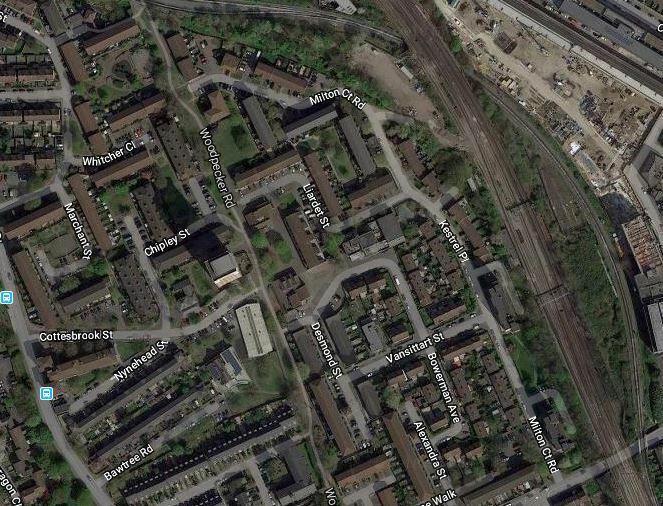 This Google Map, shows the Western end of Camden Road station. There is a train in the Westbound platform. Kentish Town Road meets the station by Camden Gardens. The overgrown unused tracks to the North of the current station. The green space of Camden Gardens, with the 88 bus stand. Could a second entrance to Camden Road station be built within the viaduct, perhaps with a ground-level entrance in Camden Gardens? It would be a short walk to the new entrance to Camden Town station. It would be convenient for walking to Camden Lock and the other attractions along the Regents Canal. If the Camden High Line is created, access to the Eastbound platform could be directly to and from the High Line, which would be a garden to the North of the station. Wikipedia says this about the re-opening of Maiden Lane station. Camden Council has suggested this station could be rebuilt and reopened, in conjunction with the King’s Cross Central redevelopment project. In June 2017, the Council were talking with Tfl on the possible reopening of Maiden Lane & York Road stations which it wished to reopen with Maiden Lane more likely to reopen then York Road. I suspect, if the station is reopened, it will be on the Southern pair of lines, currently used by the London Overgr4ound. One of the problems of reopening Maiden Lane station, is that a stop at the station would decrease capacity on the North London Line, through the area. The East London Line is one of the UK’s rail successes of the last few years. An outpost of the London Underground, through a tunnel, built by the Brunels, was turned into a modern railway with new trains and sixteen tph all day. But this is only a start! Plans exist for more new trains, an extra fout tph through the tunnel and a possible uprating of the signalling to handle a frequency to 24 tph. If the latter should happen, I feel that another Northern terminal will be needed for the East London Line. The obvious terminal is Willesden Junction station. Willesden Junction was certainly mentioned, when the London Overground was opened. There is a bay platform at the station. ,The station can be reached via Camden Road, Primrose Hill, South Hampstead, Kilburn High Road, Queen’s Park and Kensal Green stations. It will have good connections to an extended Bakerloo Line. It would create another route across North London. Would it mean extra platforms at Camden Road station? I think that there will be a very large demand for using the two old tracks for rail purposes. Normally, there is only one train per day in both directions between Dalston Junction and Battersea Park stations. Wikipedia says this about the service. But today, London Overground were running four trains per hour between Dalston Junction and Battersea Park stations, as there was a track fault, which meant trains couldn’t get between Wandsworth Road and Clapham Junction stations. I took these pictures on my journey. It certainly looked, like London Overground weren’t having much trouble, in running four trains per hour between Dalston Junction and Battersea Park stations. Because of Crossrail works, Whitechapel station had to wait to get full-length platforms for the five-car Class 378 trains on the East London Line. It at last seems the platforms are now extended. But then it is only just over a year until December 2018, when Whitechapel station opens for Crossrail services between Paddington and Abbey Wood stations.